Most above ground pools and semi-inground pools are manufactured in two shapes – round and oval. The shape you choose depends largely on your backyard dimensions and personal preference. Oval pools range in size from 8’x12′ to 21’x43′. Popular sizes include 12’x24′, 15’x24′, 15’x30′, 18’x33′ and 18’x40′, along with 20 other sizes to choose from. Round pools range in size from 12-feet to 33-feet diameter, increasing in size by 3-foot increments. A quick measurement of the area you would like to use for your above ground swimming pool is all you need to choose the perfect size. Keep in mind that all pool sizes are measurements of the inside (water) dimensions of the pool. For example, the overall outside dimensions (space required for installation) for a 15’x30’x54″ Saltwater 8000 oval pool is 18’2″ on the width and 34′ on the length. All round pool models typically require one extra foot of space. This means the overall outside dimensions of a 24′ Quest round pool is 25-feet. All information regarding pool dimensions is readily available on our website under each pool models “Specifications” tab. Do you prefer the durable long lasting resin top ledge pool? Do you prefer an economical and stylish steel top ledge pool? Would you like to use a saltwater system on your pool? Do you want the pool installed above ground or semi-inground? 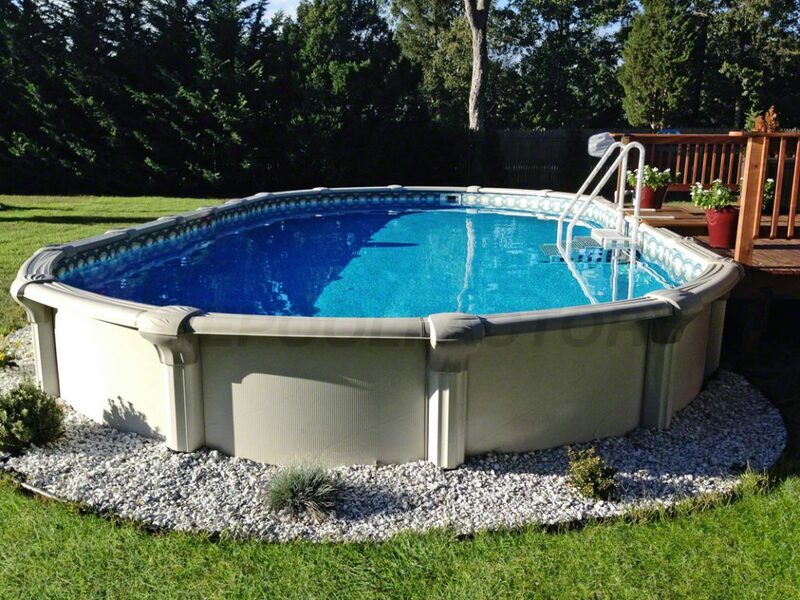 Whatever you’re looking for, we have the right above ground pool for you! 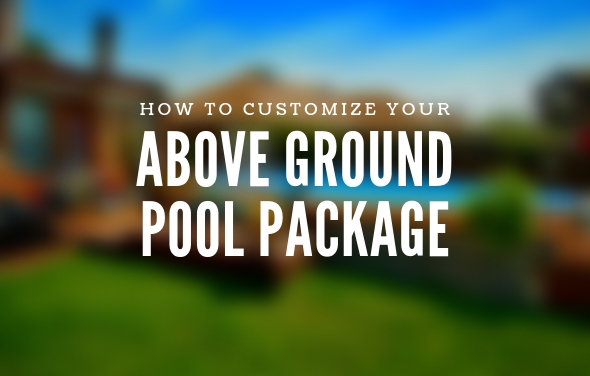 Now let’s take a look at your above ground swimming pool options. The Cameo model is an excellent option for those looking for a quality above ground pool with great value. 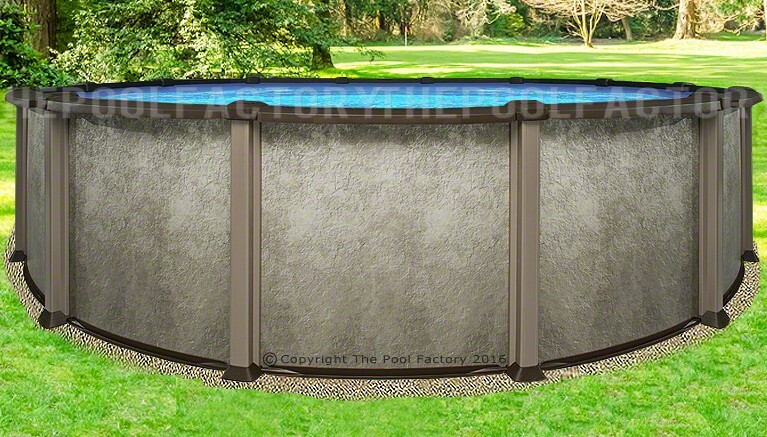 This Cameo pool features steel top ledges coated with a “Krystal Kote” finish to prevent corrosion from the weather elements and chlorinated chemicals. 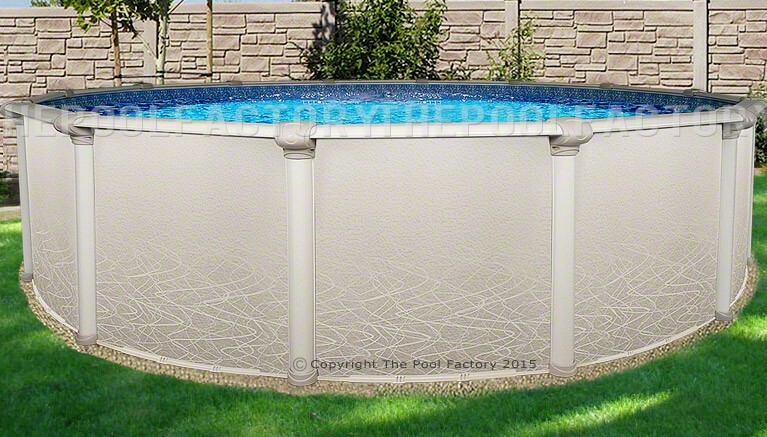 You will not be disappointed with the great look and price of the Cameo above ground pool. 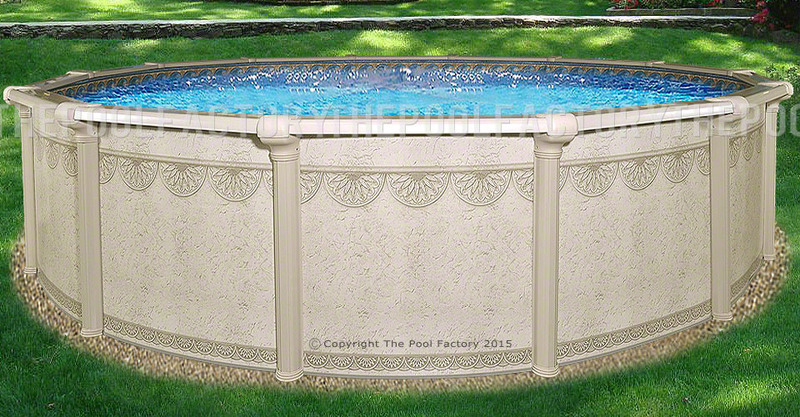 The Melenia above ground pool offers high quality, great value and a beautiful color scheme. The attractive bronze finished top ledges and mocha colored uprights will enhance the overall look of your backyard. The sturdy resin two-piece top caps and hardware free resin bottom boots adds strength and long term durability. From top to bottom, the details of the Melenia will be enjoyed for many years to come. The Signature RTL, Hampton and Quest pool models offer great quality and strength at low prices. These pool models feature resin top ledges that are completely corrosion proof and provide superior durability over time. Each pool model has unique features and beautiful colors that will complement any backyard. If you’re looking to build a deck up to the top of the pool and want to avoid the top ledges from deteriorating and bending from people constantly stepping on the top ledges, choosing one of these pool models is a great idea. Another added benefit of choosing the Signature RTL, Hampton and Quest, is the ability to install the pool semi-inground. 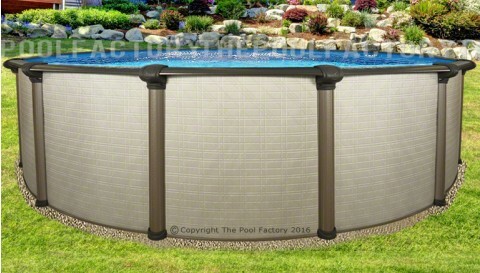 All three of these models are warranted by the manufacturer for semi-inground installation of up to halfway (26 inches for 52″ pools & 27 inches for 54″ pools) into the ground. A semi-inground swimming pool allows you to create a similar look of an inground swimming pool at a fraction of the cost. One of the many benefits of owning a semi-inground pool is the more appealing low profile look, as compared to the pool being installed completely above the ground. Incorporating an existing deck or a new deck up to the top of the pool would be easier since the pool would be buried halfway into the ground. Once you’re swimming in your semi-inground pool you will gain privacy from neighbors that may live close to you, unlike a pool installed completely above the ground. Choose one of our semi-inground pools and you’ll be able to create your very own backyard oasis at an affordable price. The Saltwater Series pool models redefine the standard of beauty and inner strength. The Saltwater 5000, Saltwater 8000 and Saltwater LX pool models feature high tech resin components that are able to resist the corrosion issues associated with saltwater and chlorinated water. 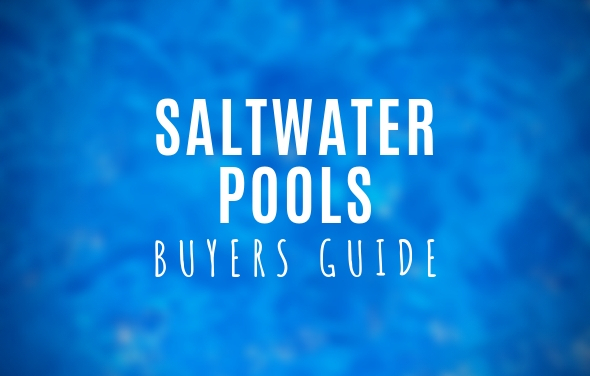 If you’re looking to install a saltwater system with your pool, these pool models are your best option, as both are warranted for use with a saltwater system. They feature resin top ledges, resin top and bottom tracks, resin connectors, as well as a stainless steel skimmer and water return panel for superior corrosion protection. You also have the option of installing these pools semi-inground, as both pool models are warranted from the manufacturer for semi-inground installation of up to halfway into the ground. The Saltwater Series pool models will exceed your expectations with its high quality and low price tag. Another pool option is the Intrepid. The Intrepid features 54-inch high-extruded aluminum interlocking wall panels that are completely corrosion resistant and unmatchable in strength. 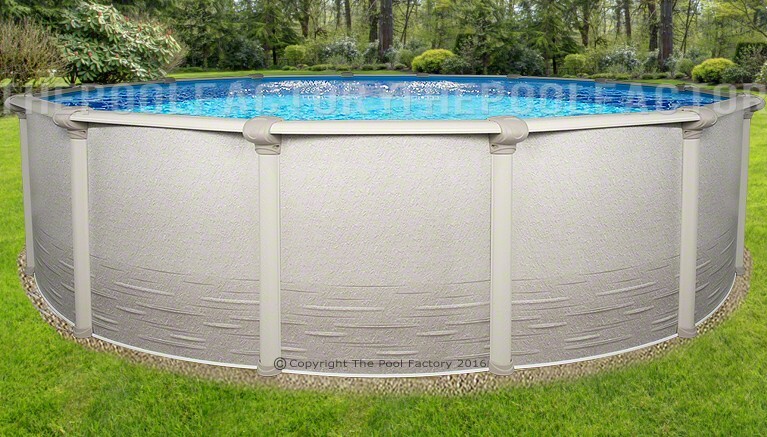 The heavy grade extruded aluminum top ledges, uprights and tracks add extra support to this superior pool making it ideal for a semi-inground installation of up to 36-inches into the ground. All of the aluminum components are powder coated to ensure a beautiful finish that will last for many years to come. 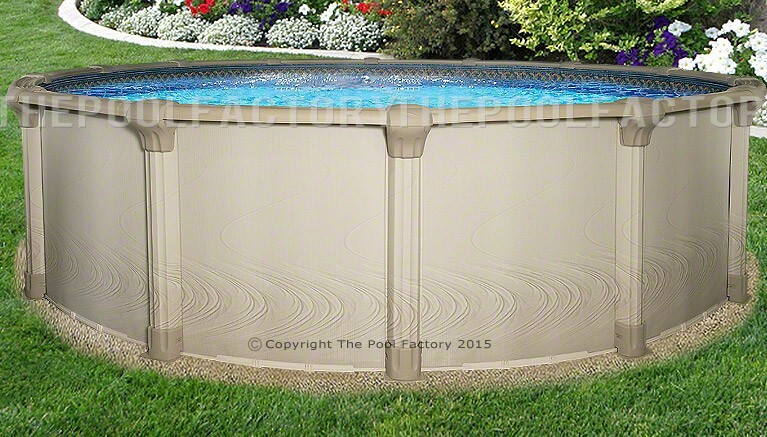 If you’re looking for a strong, long lasting extruded aluminum pool, the Intrepid pool is a perfect fit. Its new and unique design is what sets the Contempra pool apart from the rest. The Contempra introduces textures and colors that have never been seen before on above ground pools. The top ledges are printed with a walnut pattern and a bronzed steel look with metallic highlights. It is also warranted by the manufacturer for semi-inground installation of up to halfway (27-inches) into the ground. 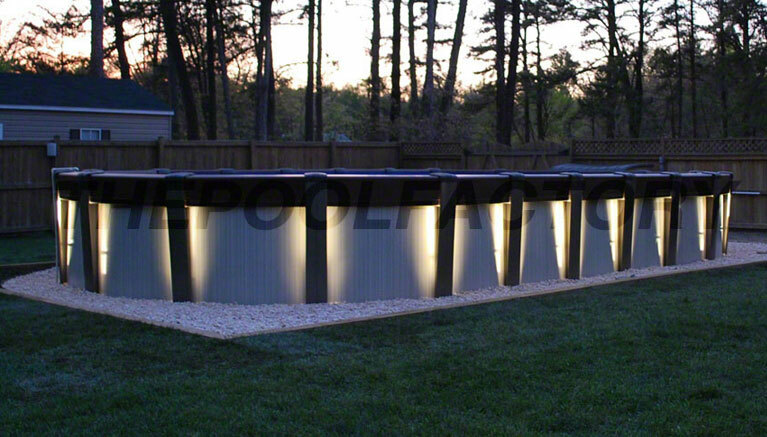 Optional LED Lighting strips can be installed behind the upright covers to enhance your backyard experience. The Contempra above ground pool is sure to satisfy your expectations if you’re looking for something different and impressive. 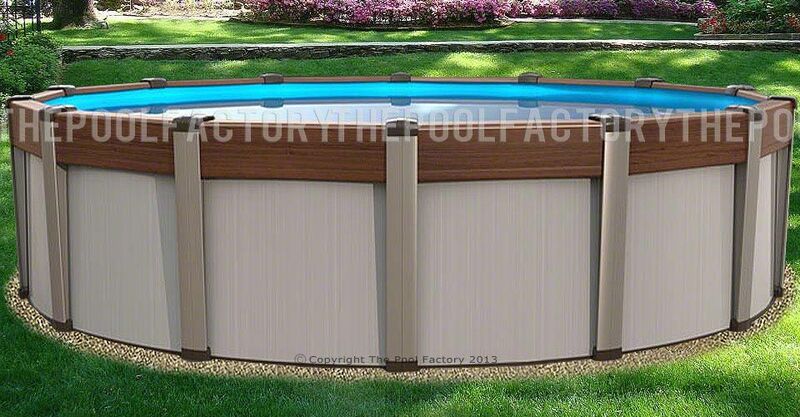 With all of these above ground pool and semi-inground pool models to choose from at ThePoolFactory.com, you’re certain to find the perfect pool to suit your needs. Looking to purchase a pool and saw one that I liked on your website. My main question is the installation. I did not see any prices for installation on your website. If I purchased from you and had someone else install, who would honor the warranty? Regardless of who does the installation, all of our pools are warranted by the manufacturer. Please let us know which pool you are interested in and we can give you more info on the warranty. Hi I want a pool, I have a small back yard, probably the 8×12 oval would work for me., do you have someone to install, how fast can this happen and what do I have to do , to get the back yard ready. I have a old pool, and looking to replace it. Thinking of going with a semi in ground, 15×24. Can you recommend a pool for me. And what the cost would be roughly. Also testimony of other customers who have had this done. Can I dig an above ground pool deeper? Give us a call at (855)280-7665 and a customer service representative will be happy to answer all your questions! For pool installation and maintenance we typically recommend a basic Google Search on “Pool Installers” with your City or State name included in the search to find a local installer/maintenance service in your local neighborhood. Any additional questions please let us know? 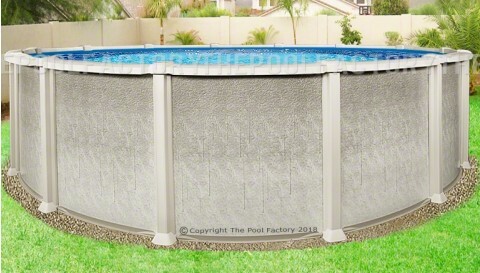 I’m putting together my cart on your web site and looking at buying the 15’x30’saltwater 8000 oval pool. I’m putting a deck around the pool and was planning on getting the Grand Entrance steps 400700 model. Is it ok for the feet to rest on the bottom of the pool? Also the AquaPro Eco500 50k BTU Electric heat pump & Chiller. Will the fact that I will be using your Hayward Aqua Trol Salt Chlorine generator system effect the warranty on it, or will it have no effect on the heater at all? The Grand Entrance Step has plastic feet that can rest on the pool liner. You can also buy a step pad if you would like to protect the pool liner even more. Sanitizing systems such as a salt system should be plumbed into place after the pool heater to avoid any corrosion issues. The Hayward AquaTrol RJ Salt System installs into your pool’s return fitting, so it will not be a corrosion problem for a heating system. We’re looking into purchasing one of your round semi in ground pools (15x30x54″). We live in southeast Alabama and installers of semi in ground pools aren’t exactly jumping out of the bushes. This is an issue that I definit want addressed before purchasing. Any possibility that you could make a recommendation or maybe come down one weekend and help me with installation, should we decide to go ahead with the purchase? Free room and board for the weekend in a great log home and if you’re really helpful with the pool installation I might could set you up with some south Alabama home cooking while your down here! We wish we could come down, the home cooking sounds good! But sorry, we do not install pools. You could try doing a Google search for “above ground pool installers” in your zip code. http://www.superpages.com or http://www.switchboard.com may also help you find an installer. There is also some great installation info on our website. Just click on the “Installation and Warranty” or “Resources” tab on any one of our pool pages and you will find an installation instruction PDF, parts listings, warranty info, and an installation video. I have a bit of a small space. Do you have any 10ft round pools or is 12ft round pool the smallest? To measure a round pool, you would measure across the middle of the pool from wall to wall on the inside. This will give you the correct diameter measurement of your pool. Hi I am interested in a semi in-ground pool do you have installers you that you can recommend? Sorry, we do not install pools. We recommend doing a Google search for “above ground pool installers” in your ZIP code. Additionally, searching on http://www.superpages.com or http://www.switchboard.com may also help you find a local installer. hi, I am interested in getting a semi inground pool. do they hold up well in the New England weather? our 24″ round collapsed this winter! Yes, semi-inground pools do hold up very well even in colder climates. You can view all of our semi-inground pools on the our main website. Please select a semi inground pool model for additional details. Can one of your pools withstand Chicago weather? Yes, all of our above ground pool and semi-inground pool models are used in the colder areas of the U.S. and Canada. Please take a look at our available swimming pool models. What’s the difference between the Cameo and Signature pool models? Are they saltwater compatible? The Cameo has a 7” Steel top ledge, 40 year warranty, and is not warranted for semi-inground installation. The Signature RTL has a 7” Resin top ledge, 60 year warranty, and is warranted for semi-inground installation. Saltwater is very easy to maintain but can be corrosive to some pool components so you would need a pool that is specifically made for it. The Saltwater 5000 and the Saltwater 8000 are both warranted for saltwater use and are featured on Saltwater Above Ground Pools page. Another great option would be the Pool Frog Leap System. Pool Frog Leap is a Mineral Water System that uses small amounts of chlorine. Like Saltwater, it is very easy maintenance but without the corrosion issues. Also, you can use Pool Frog Leap with any pool model. Can the Morada 15X30 be a semi inground pool ? Better yet can any pool be a semi-inground ? Not all pools are warranted for semi-inground installation. 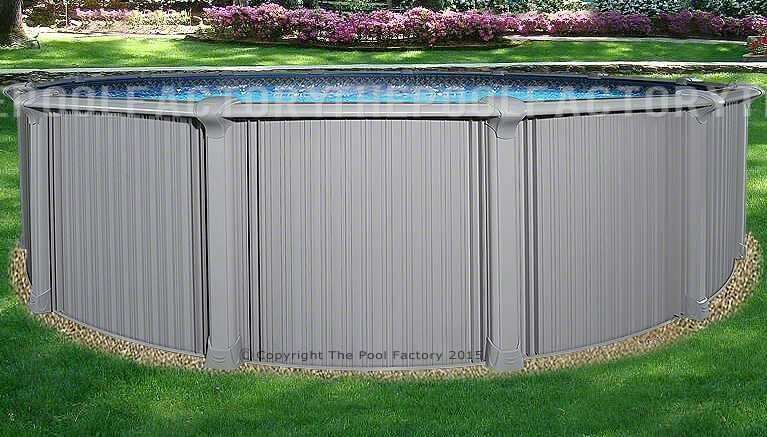 Please go to the following link to see all of our available semi inground pool models which are all warranted for installation of up to halfway in the ground except for the Intrepid which is warranted for installation up to 36″ in the ground. The wall gave way on our 20 year old 24′ round pool. It is 48″ deep with 42″ water level and has deck halfway around. My question is if we get a deeper above ground pool could we put it under ground just a few inches to match our existing deck without having to purchase a semi inground pool? Yes, most of our pools are warranted for installation of up to halfway in the ground. 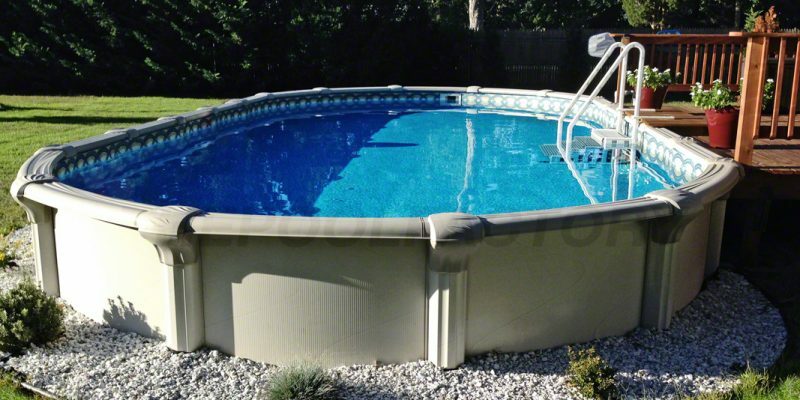 You can view our selection of semi inground pools here. We want to install an oval possibly Round, partially inground (15+\-“), but into the side of a hill. Would love it to be even with top of hill on that side, ( 36″ est)is this possible and how much could be even if any or can it just be the 26″? Most of our semi inground pools are warranted for installation of up to halfway in the ground. This would be 26″ into the ground for a 52″ high pool and 27″ into the ground for a 54″ high pool. 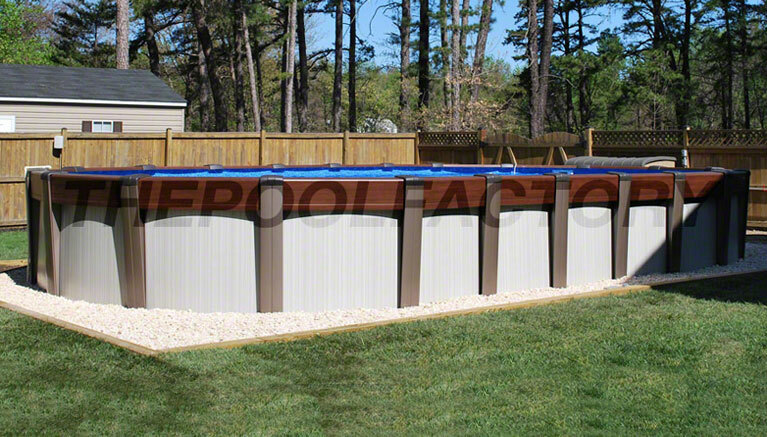 Our Intrepid pool can be installed up to 36″ into the ground. View one of our customers Intrepid pool installations in our customer gallery. Yes, during the checkout process you can choose from “PayPal Credit” option or the “Affirm” Financing option. Another financing option is with Lending Club. Please visit our Financing Page to learn more about all 3 options. Hi, I’m shopping for a pool and will likely get a 15X24 or 15X30 oval semi inground. I live on a slant and will have to dig out the hill. The upper end might be higher than 27 inches but 0″ at the lower end. Will this be a problem? 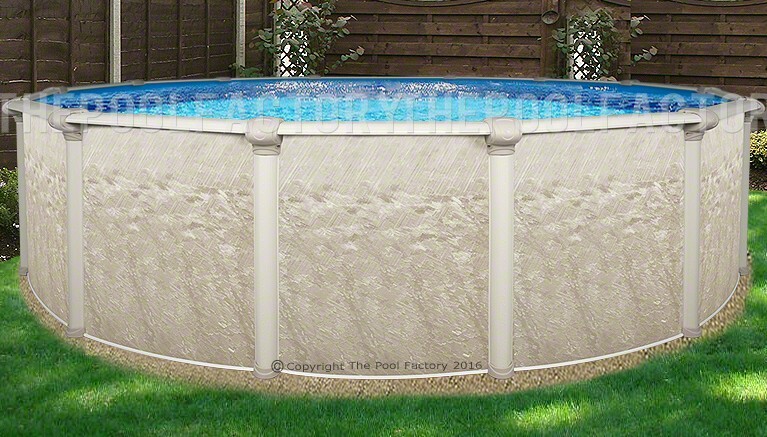 I am looking to buy a semi in ground pool I have been told that the radiant pools are the best for in ground do you sell radiants pools or do you have something thats right up there with radiant pools thanks. Do you have a recommendation for pool instillation? I’m not finding anyone in my area….Sacramento, CA.